Surrounded by 9.34 acres of lush, mature landscaping with over 150 species of flowers, shrubs and trees this significant home sits in harmony with the great outdoors and encompasses nearly 4500 square feet of living space. 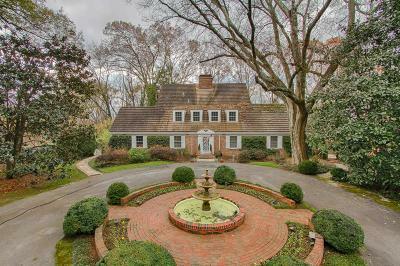 This classic home boasts a grand library with handsome paneling, inviting living room with fireplace, formal dining room, and spacious kitchen with center island and breakfast nook. The master suite and additional bedrooms can be found upstairs. The lower level features a 16x24 recreation room with exposed brick - perfect for media or fitness room. The manicured grounds also feature a circle driveway with fountain, 30,000 gallon saltwater swimming pool and outdoor kitchen. Enjoy this private retreat located just minutes from downtown Knoxville!